Silly question. My '19 VT is my first manual turbo, and it is a blast to drive. One of my favorite things about it is that it holds a bit of boost while you shift, and when you hit the next gear the power is already there, so there is no lag, or feeling that the car falls on its face for a second. I test drove a MazdaSpeed 6 back when they were new, and walked away over that very reason. It absolutely drove me nuts. Great car, but I hated that loss between the shifts. So to get to my point, will this have any effect on that? I'm not going to lie, I've always thought loud bovs were a bit silly, especially on a stock car.... but my inner child very much thinks I should have one too. But if this is going to change the feel, I'll be choked. That's a great question, and we are glad you asked! During our R&D of this valve, we took the factory spring rate into account, something a lot of aftermarket companies don't. The stock valve acts in a way that it closes slightly early so it retains a bit of pressure, like you are describing. Ours works in the same manner! Ours is pressure tested up to 100PSI to ensure a leak free operation. With our brass piston, it will last the lifetime of the vehicle as well! Please let me know when this is available, I will take one whenever you're ready, in red. We will update this thread when we finalize pricing! Pricing and pre order has been announced! Check out the link! Use code: VTBOV to save 10% on your order! 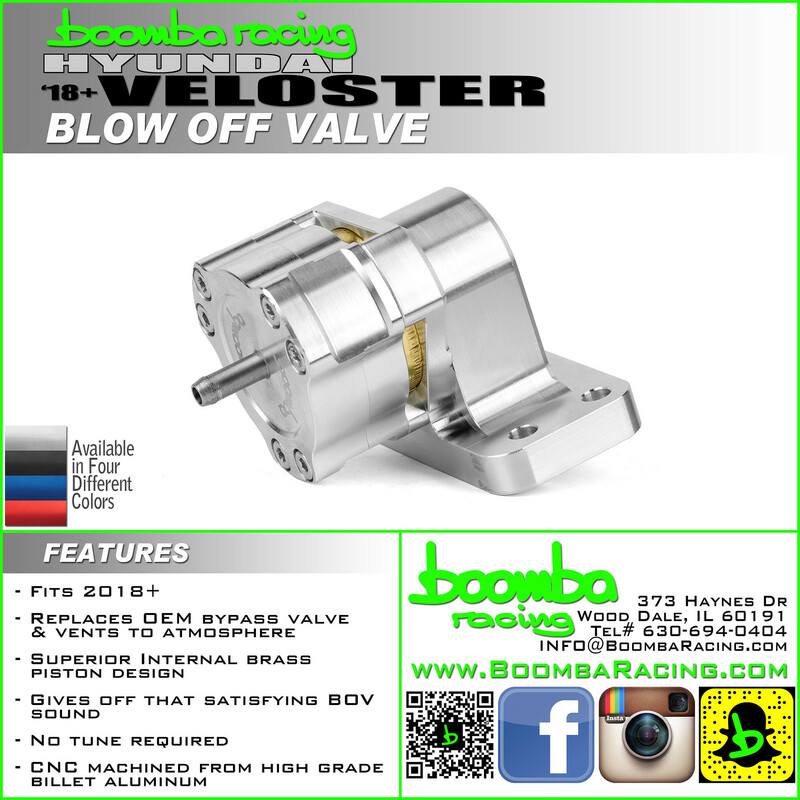 Veloster Turbo Blow Off Valve (2019+) - Boomba Racing, Inc.
Just so you know, the only reason I didn't put in an order last night is because I got a text from my Sales guy, I'm going to look at a black N after work today! So by this time tomorrow, I will have a new car, or a nice bov on the way. Remember this is just a pre-order right now! Keep your eyes peeled if you grab that N because we're making one for that too! The N wasn't amazing enough for me to want to trade, but it was a pretty cool car. I would have lost a lot of options I really like on my Turbo. So the bov is on order as of yesterday. I don't think the promo code worked though. We de-activated the code, and just took 10% off instead!